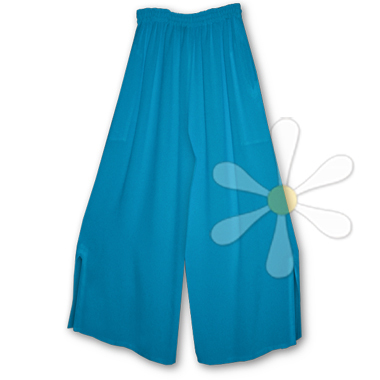 The classic ethnic flavor is just one of the many delights of these soft-as-a-kitten pants! They're made from 100% sousde -- we call it the cashmere of cottons -- loomed only in Morocco. If you've never experienced it, it's time to treat yourself! Cut wide from top to bottom so they're roomy and comfortable on a wide range of figures, they feature 11" slits at the bottom, bordered by bands of traditional trapunto, a kind of decorative topstitching. There's a comfortable wide elastic waist, stitched in rows to resist rolling, and deep side-seam pockets. They're as comfy as your favorite jammies! Designed with a distinctive ethnic look that can blend gracefully into your wardrobe... You're extraordinary -- dress the part every day. Why not?